I have lots of turkey and stuffing left. So to do something other then the sandwich, salad & soup which will come later.... I made breakfast using the stuffing & some turkey. I added stuffing to a bowl with chopped turkey and added a Tbsp of flour & a beaten egg, S&P, then made a patty and fried it to brown. 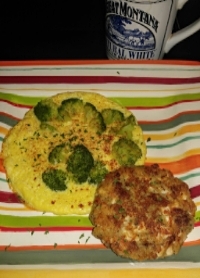 Left over broccoli to make an omelet. Gravy or cranberry sauce will top it off. As with all my leftovers (planned), first I made 6 lunches to freeze for DH and DS's second shift dinners. I put them in 2 and 1/2 cup rectangular freezer to microwave containers. Stuffing, turkey w/gravy, copper pennies carrots. All told there is a 2 quart container of each stuffing and turkey, and a pint of gravy left from the turkey this morning. I took the rest of the turkey bones, skin, scraps, and am boiling that up with herbs, to make a concentrated broth, to make gravy or use the broth in a soup. Our two favorite leftovers are turkey sandwiches and stuffing w/gravy. We aren't very creative. We don't have any leftovers, 'cept for the ones that were sent home with us, which are enough for a generous evening meal for the two of us. However...in the past I have chopped some of the meat from the turkey, added some gravy and stuffing/dressing and filled crepes with it. Then I drizzled a little more gravy over and sprinkled a little finely-shredded Swiss cheese. Usually made 8 or so of these and put them in a flat casserole and heated them, covered, in the oven until hot. They're pretty good and can be served with cranberry sauce or any other sides that are left. Blissful, how do you determine how much to concentrate the stock and how much water to add later? Like, how long do you simmer it and in what size containers do you store it? I'd love to do that, too, to save space in the freezer. I started with about 13 cups of water, added herbs, all the turkey stuff left. It needs to cover it because the turkey was only cooked for 90 minutes, so the thighs and wings and drumsticks have a lot of tendons/connective tissue/and quite a bit of meat stuck to that, and it needs to melt down and start falling off and apart. After 2 hours everything (now) is softened and fits better in what is probably just 10-11 cups of broth. Now I'll simmer it until it is about 6-7 cups of broth, strain it, and portion it into containers, some to use and some to freeze. I'll pick out any meat and put it in the soup container from the strainer. I don't see why you couldn't simmer that into half of that, so less than 4 cups of seasoned, w/meat, broth. Containers, I use 16 oz cottage cheese/sour cream containers, put a white label on it. If it was very rich, I'd label it rich, and add half again as much water when I used it. We're having a redo of yesterday's dinner tonight. We'll also have sandwiches over the next few days. At the end, I'll make turkey, gravy and stuffing "shepherds pie". We'll hwbe a T-Day leftover dinner in a couple of days. Then, the turkey meat that is leftover will go into either a turkey potpie or a turkey vegetable, wild rice soup we like. Sandwiches then cream of turkey confetti soup. Mmmm Butter. For dinner I sautéed stuffing patties with a little chopped turkey and a little gravy to bind and mash potato patties. A spoonful of gravy on both and a spoonful of cranberries on the side. I scored quite a bit of stuffing as we found a casserole in the basement frig when putting stuff away last night that we had made but didn't need to reheat for dinner. Also there was some turkey and quite a bit of gravy I brought home too.